When you add the term SuperBee to the already elite line of vehicles (the Charger and Challenger) you would expect something epic. But is that really the case here? When you add the SuperBee package to an SRT8 Charger and Challenger you actually get rid of things, opposed to adding performance parts. In exchange for nicely trimmed leather seats, you will get cloth seats with a yellow stitching. Dodge also got rid of heated/cooled seats, and don’t forget the cup holders! those where also removed. For some reason Dodge deemed it necessary to remove the cooled cup holders in exchange of a weight reduction of about 5 pounds, Also an 18 speaker sound system is removed for the same reason of weight reduction. The navigation system will be removed in exchange for a 4 inch screen, for your media center. But Wait! What will be the reason for all these luxuries being removed, if you do not get anything in return? But you do get something in return, you will get a yellow paint job and a really, really cool, flat black paint stripe across the trunk lid. So yea that is it. The power train is the same, the interior is downgraded (all to save about 200 pounds which is irrelevant in such a heavy and powerful car), and the sticker price is a bit higher. So if you want to drive just as fast, but be boring, then get a normal SRT8 Charger. 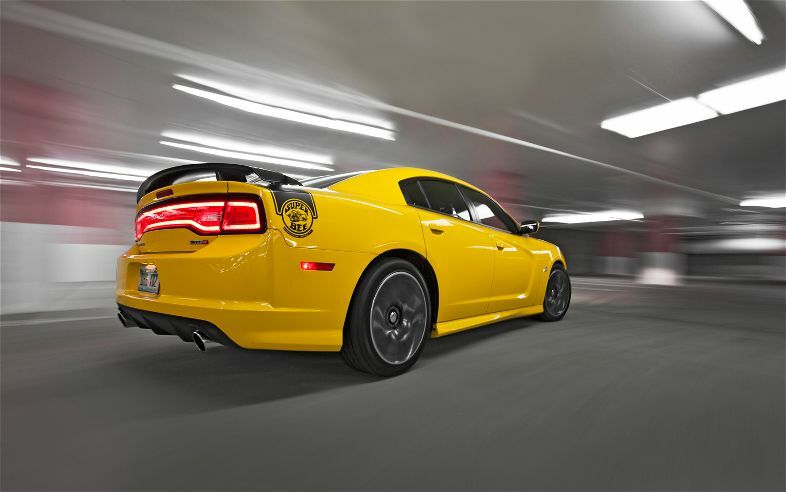 But if you want to seem like you are going fast, and look good while you are pretending to be going fast, then the SuperBee is the muscle car for you.